I had always had a problem with the original release of "Stage" in that the tracks were not in the proper setlist order, the "Ziggy" tracks came at the beginning, not half way through the set, for example. Now the songs run in the correct setlist order and there are some additions, and, for me, the album is now all the better for it. With regard to Bowie's "chat" between songs that some people have said over the years that they want to hear, it really doesn't bother me so much. Indeed, to be perfectly honest, I would rather they are not there! I am remembering the "give me a man with a strong arm" bit that came into the "Santa Monica" recording. With regard to the placing of "The Jean Genie" and "Suffragette City" in the setlist, I agree with some with reference to "Genie", it doesn't sit particularly well after "Be My Wife" from "Low" and before "Blackout" from "Heroes". "Suffragette" coming after "Ziggy" is, however, perfectly acceptable - that's what it does on the original album, of course. Anyway, these are minor things. What order Bowie chose to play the songs was his choice, after all. Also, it is a great "proper" blues rock version of "Genie" in comparison to the irritating "slowed down verses" versions that appeared on "David Live" and "Cracked Actor" from the "Diamond Dogs" tour recordings. This is my favourite live version of “Genie". Regarding the remastered sound. For me, I think the remastered sound on this 2017 release is wonderful. Highlights being the drum and guitar sound and stereo separation on "Be My Wife", the (possibly) electric violin sound that greatly enhances "Warszawa", the synth and drum intro to "Speed Of Life", the beautifully warm bass on "Heroes", the thumping bass on "Breaking Glass", and the funky intro to "Blackout" which improves on the original, in my opinion. Indeed all the "Low"/"Heroes" tracks are played really well and offer differences to the originals. Particularly impressive is how good the instrumentals sound. Very atmospheric. I always wondered if they would come over convincingly, live, and, scattered around the set, they certainly do. You get the sombre feeling of "Sense Of Doubt" followed by the cheerfully upbeat "Speed Of Life". Great positioning. The "Ziggy with synthesisers" material less so, I'm afraid. "Hang On To Yourself" and "Star" particularly suffer with synths dominating instead of solo searing guitar intros. Also the intro to "Ziggy Stardust" itself. Never mind. 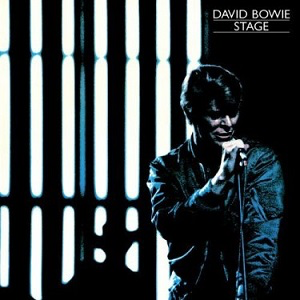 I listen to "Stage" to hear the "Low", "Heroes" and "Station To Station" material played live. The "Ziggy" era songs can be found better elsewhere - "Santa Monica" and "Hammersmith Odeon". 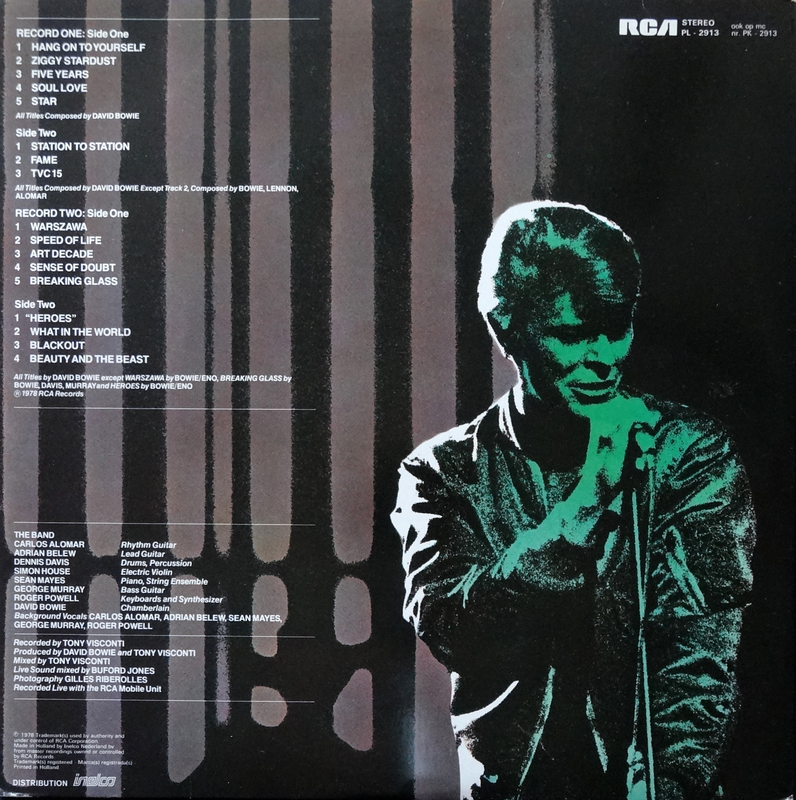 Apparently "Station To Station" is a recording made up from two different concert recordings, a cut and paste job. To be honest, you can't really tell, although once you know you sort of can ( I wish I hadn't read that in Nicholas Pegg's excellent book!). Overall I find this a most rewarding release. I obtained it via the "A New Career In A New Town" box set. The original CD release with its strange running order is contained there too and has now been rendered irrelevant by this one.